This is my first completed project in quite some time! Some friends of mine are having a baby girl in a few months so I thought I would whip up this little bonnet for them. I suppose you can guess which book this pattern is from…..More Last Minute Knitted Gifts! The nice thing about something like a bonnet is that you don’t have to worry too much about washability or pilling. 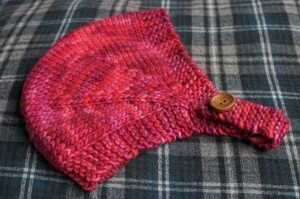 I knit mine up in the super soft Malabrigo Worsted in a variegated red. This bonnet is knit up on straight needles from one side to the other, no seaming! While I haven’t knit anything on straight needles in quite some time, it was kind of nice, it kind of brought me back to when I first started knitting. I knit almost everything on circulars these days! This bonnet knit up super quick, just an evening and it was done. It also involves one of my favorite knit wear accessories: a fun button. It’s always nice to finish off a project all in one go, then you can focus on picking out the perfect button. This entry was posted on Tuesday, September 7th, 2010 at 10:49 am	and is filed under Uncategorized. You can follow any responses to this entry through the RSS 2.0 feed. Both comments and pings are currently closed.